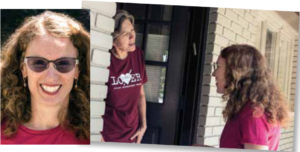 A former state representative, Lipton defines herself as “a fierce defender of public schools” and opposed to “any efforts to privatize our public education system.” One of a spate of Jewish women candidates in Michigan this year, she supports raising the minimum wage, and providing universal health care. Lipton, 51, helped to create the Progressive Women’s Caucus to elect pro-choice women to the legislature. And she learned some surprising things about how women view the opportunity to run for office. She told Joan Roth that “in certain communities where I was recruiting…they were comfortable with the philanthropic aspect” of supporting others to run, but that, especially before 2014, “they could not wrap their heads around running for office. Ellen Lipton’s own path into politics has been unconventional. She’s a patent lawyer who trained as a biochemist. “I represented a lot of universities in the biotech area. I would still be doing that, frankly, but I was diagnosed with M.S. During the course of treatment, I was treated with new drugs that had all been invented by stem-cell researchers. In Michigan at the time there was a complete ban on stem cell research. Many legislators in Lansing had no understanding at all of the fact that stem-cell research and abortion were two completely different things! We collected almost a million signatures and put the issue on the ballot before the voters. “That experience inspired me to run for [state] office in 2008,” she said, although like so many other women she had initially been reluctant. When approached by the stem-cell group to run, she thought “That is odd for a patent lawyer”—further proof of her own hypothesis that women are more reluctant to say yes than men are. She served for six years in that legislature—the maximum term—and helped create “Promise Zones.” Students in those economically disadvantaged areas qualified for two years of community college free. A Lipton mantra seems to be, “Not everything can be fixed by quick fix. You have to see the long view. Plant the seed.” And those 10 initial Promise Zones have now grown to 50, she said proudly. When she left state office in 2014, she received a phone call from EMILY’s List. “I was getting dinner ready. I thought it was a solicitation call. I said, ‘I always give’. They asked ‘Would you think of running for Congress? Will you talk to us?’ I met with them and they gave me the story at the time…that three men had already announced, boom, boom, boom, and people were asking where are the women? That’s my point…men are just ‘I’m gonna run, I’m gonna run’. “I won’t say that legislative experience is necessary, but I think about all the things I learned—how do you use the committee process, pull together different issue interests, manage lobbyists…. The number one thing that legislators do when they leave office is to become lobbyists. To see the arrogance of the lobbyists walking into an office…. ‘Oh I’m going to be going to your fundraiser in a few minutes—oh, and by the way I am interested in a bill that is coming up’ …. “When I’m asked why can’t Congress pass better gun laws, I say, ‘I have three letters for you: N-R-A’. The only way to change things is to literally cut their influence from the various Congresspeople they are lobbying. I was on the Michigan judiciary committee, and every time we tried to bring in bills that would expand background checks in Michigan, raise the age to buy guns, forbid open carry in public outdoor events, the N.R.A. had such a stranglehold on the caucus that we couldn’t even get a hearing on the bill. “When I decided to run for office I knocked on 12,000 doors. Until you walk the community house by house and talk to people in their safe space, you don’t really know a place. You talk to people in their homes, where they’re sharing with you the kind of issues keeping them up at night.